: New York Merchandise Co., Inc. 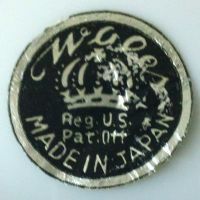 The New York Merchandise Co., Inc. was a company which imported and distributed ready-made items from various unnamed manufacturers located in Japan. 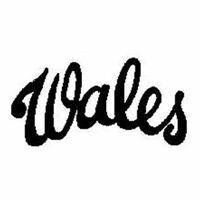 They specialized on relatively cheap tableware, miniature tea sets and figures, re-selling them under their WALES CHINA brand. As far as I could find out, the company existed through the 1960s and closed around 1970. They never claimed the rights on first renewal of the marks, hence the registrations were later automatically removed from the USPTO registry. 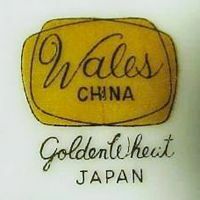 'Wales China' stickers are sometimes found on items marked either with a printed or inmold (raised) crossed swords mark plus the printed addition 'Bone China Lace'. 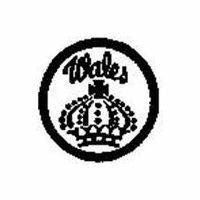 Like all other items that carry a 'Wales China' sticker, they of course represent items created *for* the 'New York Merchandise Co., Inc.' by another company. I have listed some mark examples in the unidentified company section under the handle 'Bone China Lace'. Filed July 10th 1953, registered on May 17th 1955 as USPTO №·0606189. Gold sticker with white overprint. 'WALES' above 'JAPAN', all above 'REG.U.S. PAT.OFF.'. 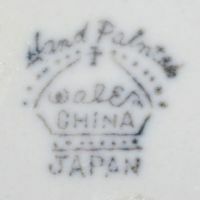 No date known: tableware mark with 'WALES CHINA' above the series name 'GOLDEN WHEAT' and 'JAPAN'. Filed November 2nd 1953, registered on January 3rd 1956 as USPTO №·0618801. Gold sticker with black overprint. 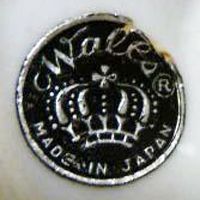 'WALES' above crown, all above 'MADE IN JAPAN'. 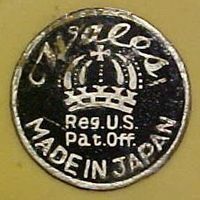 Filed April 10th 1956, registered on Februar 12th 1957 as USPTO reg. №·0641555. 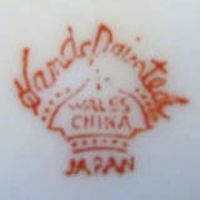 Simple basic red version: 'HAND PAINTED' above a crown containing 'WALES CHINA', all above 'JAPAN'. 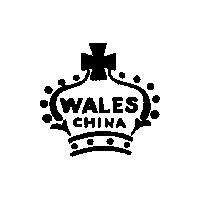 Simple basic black version: 'HAND PAINTED' above a crown containing 'WALES CHINA', all above 'JAPAN'. 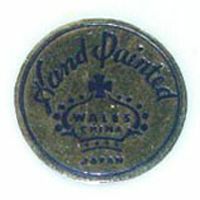 Regular red version: 'HAND PAINTED' above a crown containing 'WALES CHINA', all above 'JAPAN'. 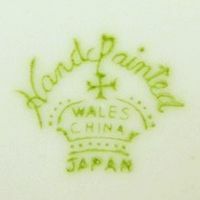 Regular green version: 'HAND PAINTED' above a crown containing 'WALES CHINA', all above 'JAPAN'. Gold sticker with blue print. 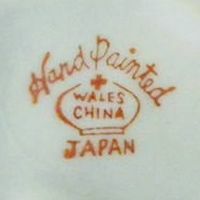 'HAND PAINTED' above crown containing 'WALES CHINA', all above 'JAPAN'. Silver sticker with black overprint. 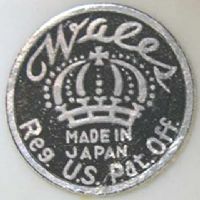 'WALES' above crown and 'REG.U.S. PAT.OFF. 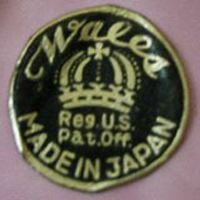 ', all above 'MADE IN JAPAN'. Golden sticker with black overprint. 'WALES' above crown and 'REG.U.S. PAT.OFF. ', all above 'MADE IN JAPAN'. Gold sticker with black overprint. 'WALES' above crown and 'REG.U.S. PAT.OFF. ', all above 'MADE IN JAPAN'. Silver sticker with black overprint. 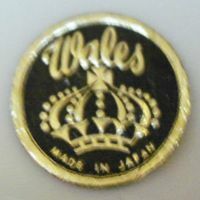 'WALES' above crown and 'MADE IN JAPAN', all above 'REG.U.S. PAT.OFF.'. Silver sticker with black overprint. 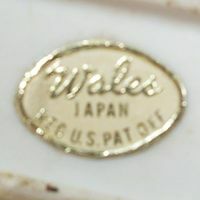 'WALES ®' above crown, all above 'MADE IN JAPAN'.